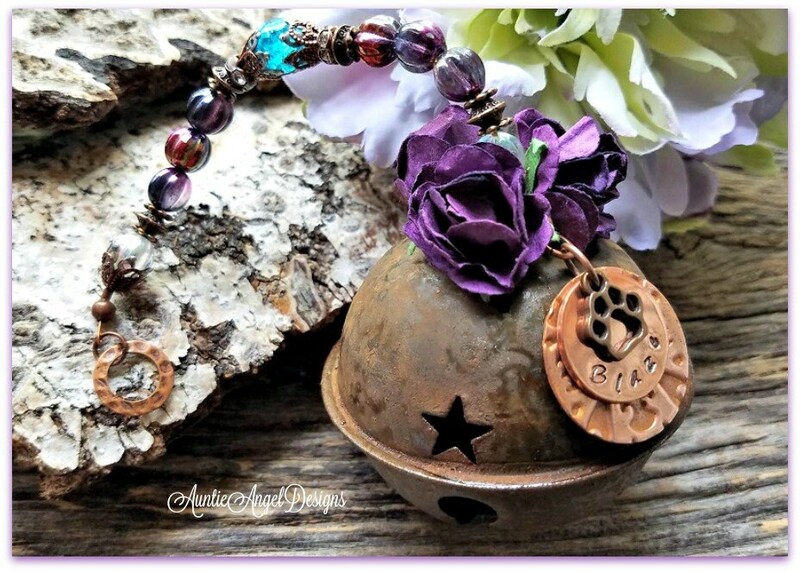 A classic and feminine twist on a rusted jingle bell for a special pet mom by Auntie Angel Designs that makes the perfect gift of remembrance all year long. 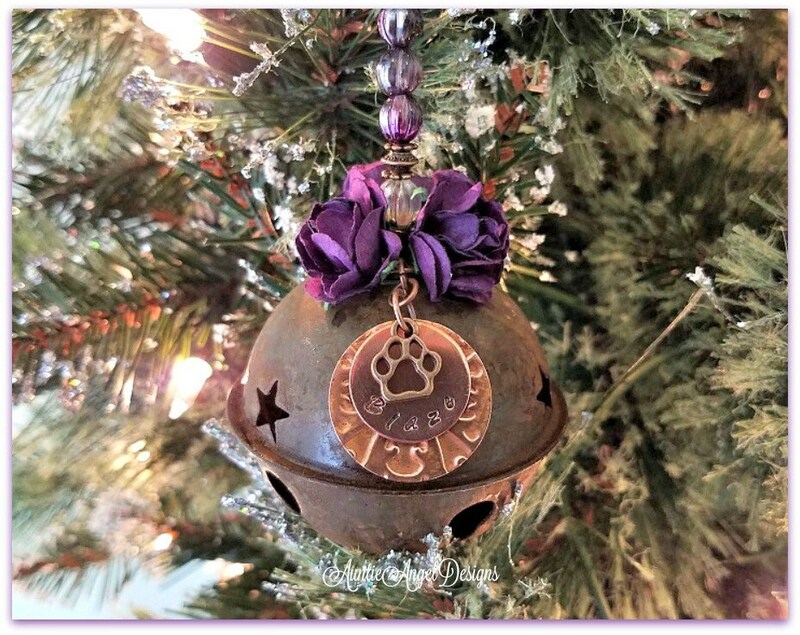 Your ornament will feature a 3/4" copper disc with the pet's name lovingly hand-stamped at the bottom topped by an antiqued copper open paw print charm. This stamped name disc rests over an independent handmade and pure copper embossed disc. The embossing/debossing appears on both sides of the larger disc, which is 25.5 mm in diameter, slightly larger than the size of a quarter. 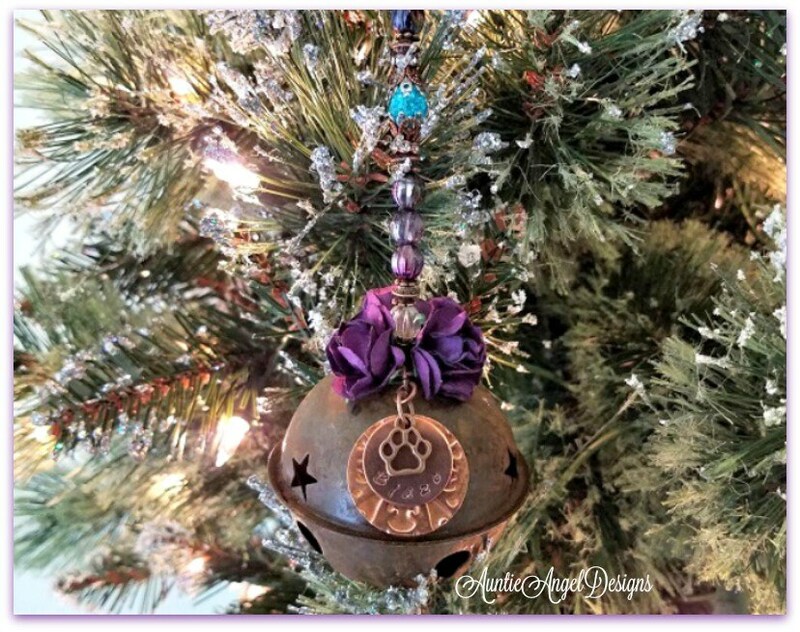 Note: Each embossed disc pattern will vary from ornament to ornament. As each name disc is stamped one letter at a time by me, it will not look like it has been engraved by a machine. Slight differences in orientation and spacing may, and most probably will, occur from piece to piece, which will only add to the character of the piece. 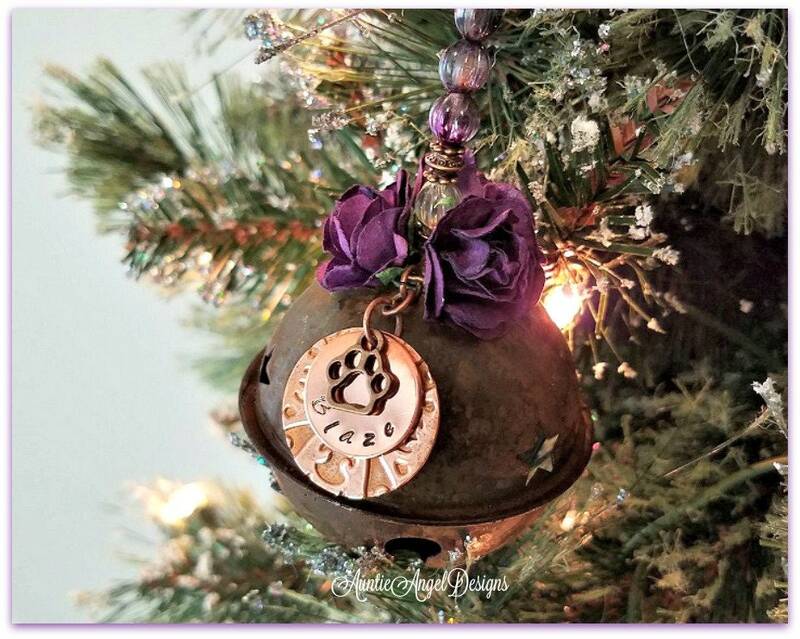 The rusted tin sleigh bell is 65 mm in diameter and is topped with three paper millinery roses. 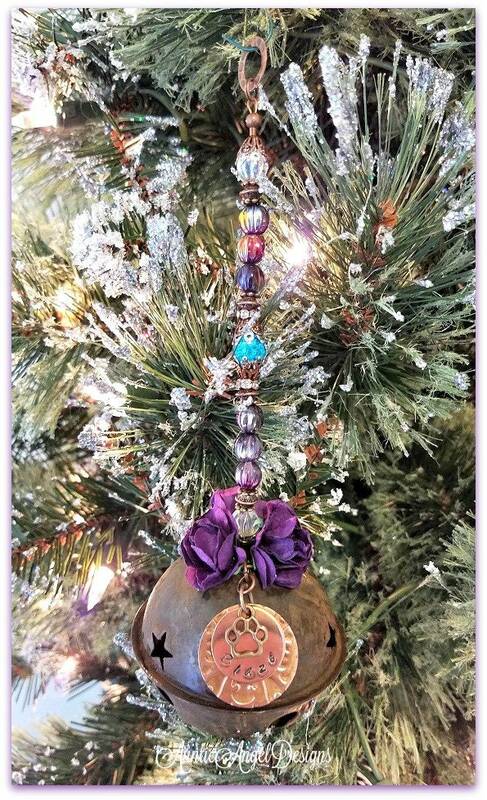 The bell dangles from a strand of beautiful dark purple AB finish melon beads with a turquoise-colored glass crackle bead. The beads are accented with antiqued copper filigree bead caps, copper rhinestone spacer beads, and silver-plated gothic-style bead caps. This ornament's total beaded length is approximately 7.5" long. 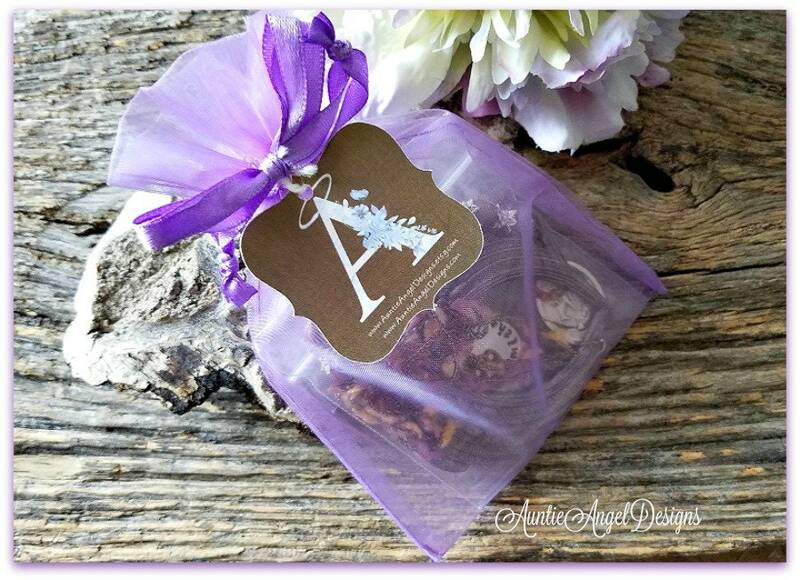 You will receive ONE ornament in a lavender organza pouch as its gift wrap. 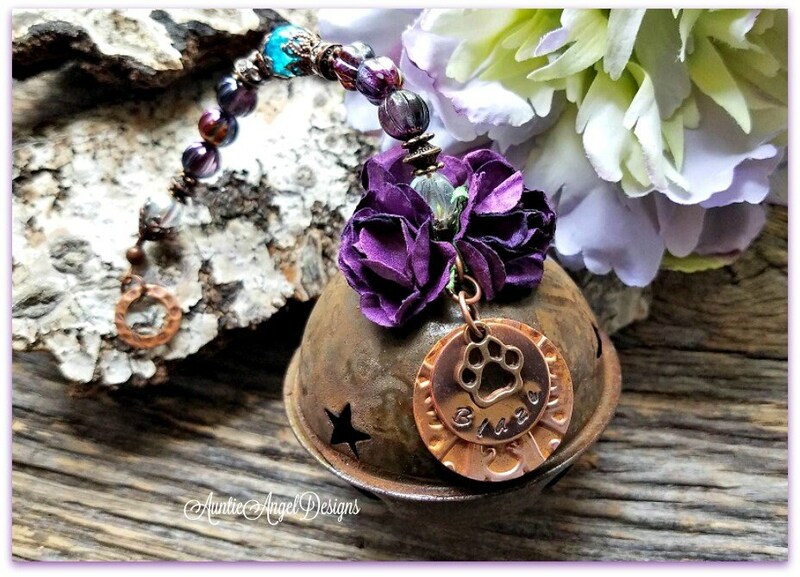 This piece is hand-stamped with the pet's name -- and a year, if you wish -- and on only one side of the disc.